AIE offers independent design verification, finite element analysis, remaining life assessment, re-rating, fitness for service (FFS) and adverse mechanical design options for the majority of heavy equipment found in the oil and gas, power generation, nuclear industries. We provide fitness for service assessment solutions for our clients, allowing them to avoid or delay costly repairs whilst at the same time ensuring that equipment is operated safely. Our independent engineering solutions and expert consultants provide support over all phases of the equipment life cycle from appraisal through to decommissioning. A robust mechanical design is the primary barrier in preventing in-service damage mechanisms from occurring. Our engineering team specializes in providing expert design options where adverse operating conditions or problematic scenarios require an innovative, defensive or unique design concept. We specialize in design by analysis techniques which are engineered to fully withstand the operating environment within the Oil and Gas, Power Generation and Nuclear industries. Overlooked or incorrect design and fabrication can result in serious safety consequences in operation or become extremely expensive to reverse once equipment enters its operational life. Our third-party design verification service ensures compliance with project requirements and international codes & standards whilst also providing a barrier to eliminate errors and establish the integrity management system for the equipment. 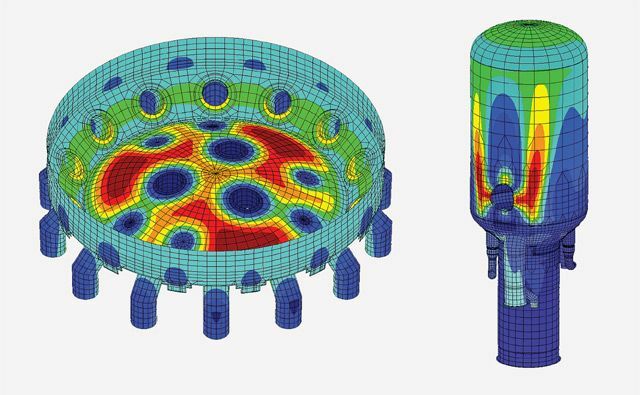 Our fitness for service and finite element analysis team assess all primary modes of failure including cracking, fatigue, corrosion, creep, erosion and fracture in industries such as Oil and Gas, Power Generation and Nuclear. The FFS and FEA assessments we provide are practical, clearly communicated, cost effective and delivered to the highest Oil and Gas, Nuclear and Power Generation industry standards. The output of our FFS and FEA assessments allows our clients to make appropriate decisions on running as-is, retiring, re-rating or altering equipment prior to operation. We not only provide quantitative analysis but assist in defining the risk and consequence of all possible scenarios, allowing the most appropriate options to be understood and implemented.